← Will You Still Need Me? Will You Still Feed Me? It’s called the Bridge of Strings and when it opened in Jerusalem in 2008, like so many other things in that city, it was controversial, criticized as too extravagant by some, and as out of its element by others as it welcomes visitors who come to that ancient city from the north. 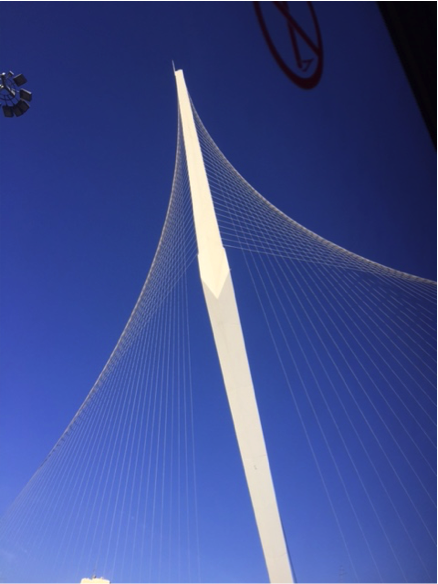 Designed by the renowned Spanish architect Santiago Calatrava, the bridge is marked by a 119-meter high mast with 66 steel cables arranged in a parabolic shape, resembling both a tent in the desert and a harp. But Calatrava also was influenced by what he said is the Latin origin of the word “religious,” stemming from re-ligare, meaning “to create a link.” Fittingly, thus, the light rail line that travels across the bridge connects both parts of that contentious city, winding through both Jewish and Muslim neighborhoods. For in the end, if the rocks were ready to cry out, even the loudest critics couldn’t silence His voice. And the good news is, they still can’t. Thank you, sir. As always, a good reminder for all of us trying to make sense of the insanity around us. God bless you and your family.